As the race for Chicago mayor heads to the final stretch, it appears the Obamas won't be endorsing a candidate in the run-off election for mayor of Chicago. A spokesperson confirmed to NBC 5 Thursday the "Obamas do not plan to endorse in the run-off," despite reported calls for them to do so. Multiple sources said Thursday there were calls to former President Barack Obama and Michelle Obama to endorse Toni Preckwinkle. The Obamas still own a home in the city's Kenwood neighborhood and voted by mail in the February 26th municipal election. 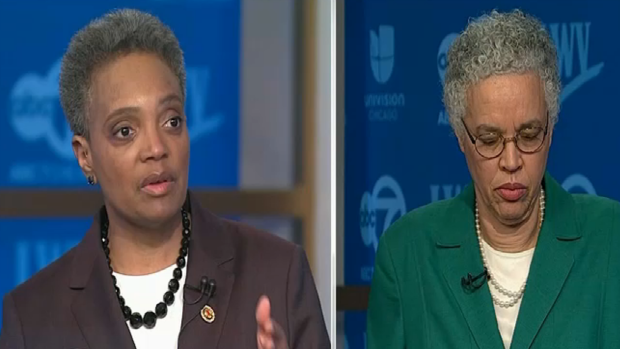 Preckwinkle finished second and now faces Lori Lightfoot in the April 2 runoff. Preckwinkle and the Obamas have a long history. In 1995, Obama - then an attorney and professor at the University of Chicago - visited Preckwinkle, who was his 4th Ward alderman at the time, as he eyed a campaign for the Illinois Senate. Preckwinkle ultimately supported him in that race, a testy contest that ruptured many friendships and political alliances on the South Side. In 2000, she backed Obama again in his unsuccessful Congressional run against Rep. Bobby Rush. She also endorsed him in his campaign for the U.S. Senate in 2004. The Obama-Preckwinkle relationship has not always been rosy, though. Reports indicate Preckwinkle wasn't fully on board when Obama announced his run for the White House, though she did eventually serve as an Obama delegate. Obama has returned the favor in the past, endorsing her 2018 re-election campaign for Cook County Board president just days before voters cast their ballots in the Democratic primary. Preckwinkle has also already nabbed the backing of several former White House staffers and Obama confidantes in her mayoral race, including Valerie Jarrett, John Rogers, Ken Bennett and Tina Tchen - all members of the Obamas' inner circle. But will the former president - whose library is headed for Chicago, but has lived in Washington, D.C., full time since 2009 - personally step in to help out his longtime friend once more? It appears not.